This DVD sees the start of a series of titles covering real world street knife defence and use. Seeing what many others are teaching about how to use a knife in a real self defence situation, this series is an attempt to show and teach students how NOT to be killed using stupid techniques such as grabbing the arm that is holding the knife! Erle Montaigue lends his vast experience in the real world of knife fighting. In this 2nd volume, Erle covers more on "Eagle Vision" and how to "If Someone Attacks you, Attack Him First" methods. Plus we begin the exciting area of "Bagua Knife" which means 8 Diagram Knife. 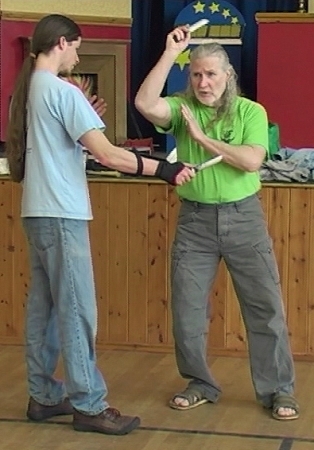 There are 8 two person training methods firstly using a fighting stick which represents a knife. Each set also has 8 either defence/offence and kill moves making a total of 64. We then go on and use the rubber knife using those same 8 methods. This is an excellent way to take your movements to a reflex level. You will need a rubber practice knife, some arm guards, a real knife and a piece of dowelling about 2 feet in length. (60 cm).